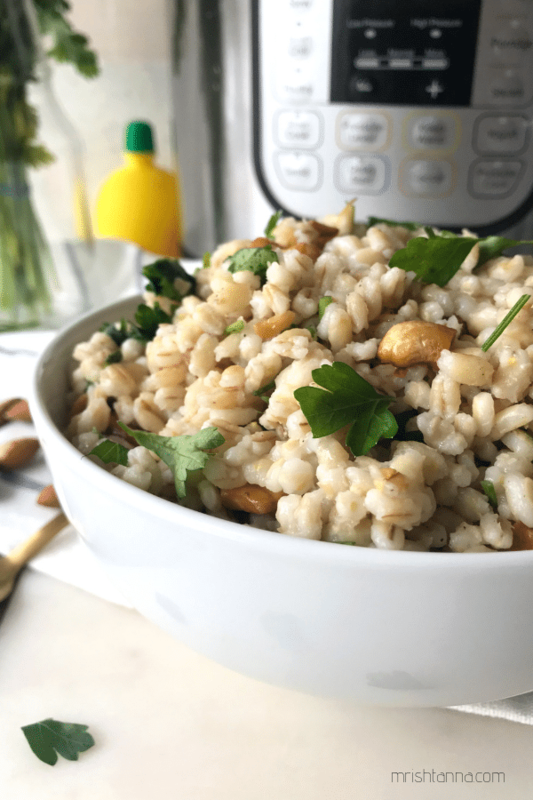 This healthy, wholesome Instant Pot Barley Salad is packed with flavor from lime and garden-fresh parsley. What a great option for lunch, picnics, potluck parties or a quick fix dinner! Barley salad is a salad that can be served warm or at room temperature. It pairs very well with a side soup that fulfills the protein part of a balanced meal. 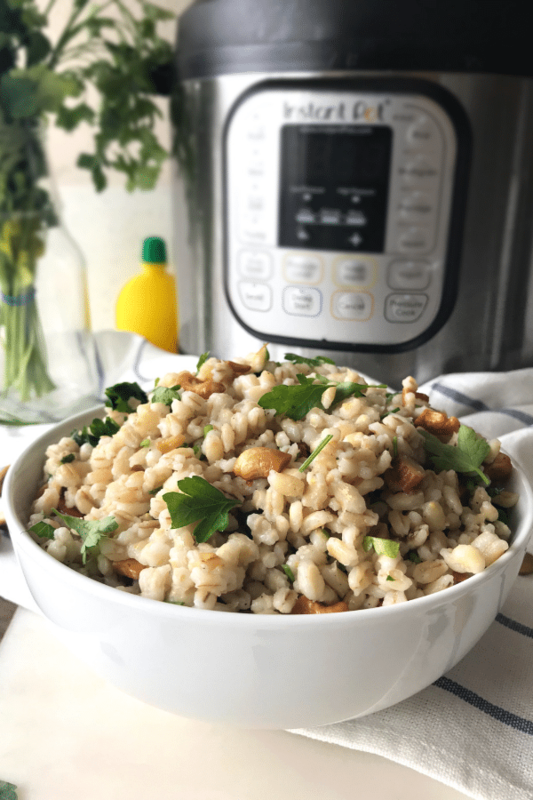 What makes it a quick fix dinner option is that cooking barley is made easy with the Instant Pot. Cooking barley grains on a stovetop can easily take more than 30-45 minutes by itself. The Instant Pot cuts that time by more than half. 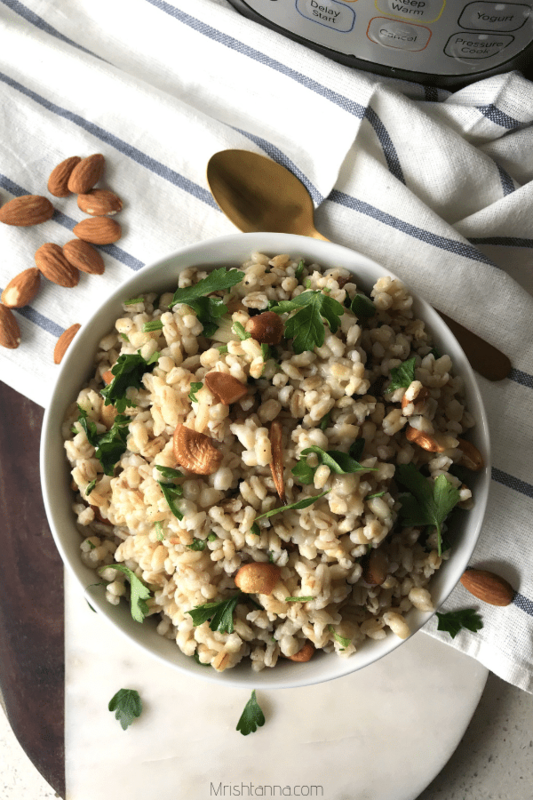 How to cook barley in Instant Pot? Cooking barley always takes a long time and demands a lot of patience, and prep work ahead of time. 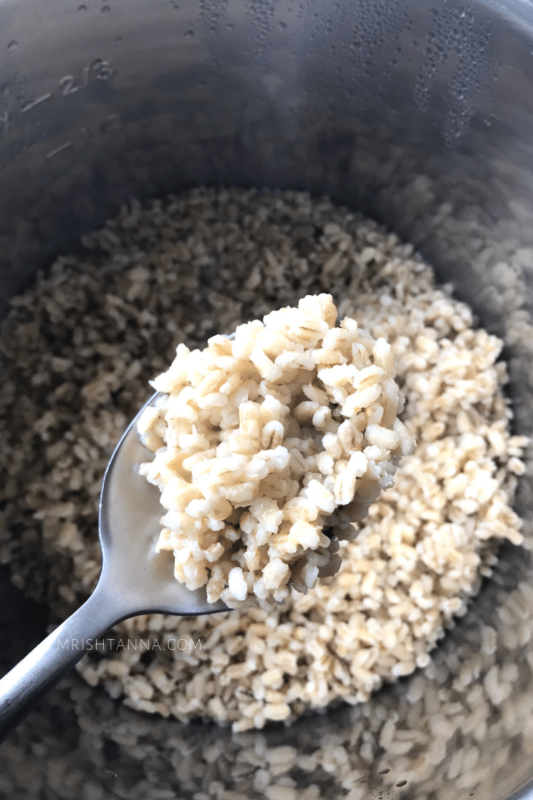 If you are a fan of barley and its amazing benefits you will be amazed by how easy and efficient it is to cook them with the Instant Pot. It cooks in 12 minutes under pressure with a natural pressure release method. You can serve this with freshly cooked kale or sauteed mushroom. maybe that will be your barley kale salad or barley mushroom salad. This barley salad can be served in any season of the year. Add your favorite vegetables, toppings, vegan salad dressings and enjoy the meal. As the weather turns colder, adding some whole grains such as barley to your diet is a great idea to build some resistance to the cold from within. Barley’s claim to nutritional fame is based on nutrients such as manganese, dietary fiber, and selenium, and magnesium among others. But barley does not necessarily come with any strong flavor. Hence the ingredients you add to it need to be carefully chosen to blend well barley grains. Selecting ingredients was a trial and error process, but I think I have a winning combination here. I have added toasted nuts like Cashews and Almonds along with lime juice and parsley. The choice of nuts is really up to you, as long as you toast them golden brown. The other prime ingredient is garlic. Roasting garlic to a crunchy texture before adding the boiled barley grains makes a world of difference. My family loved it including my kids. Serve it as a side with a hot soup or curry or make it the primary dish. 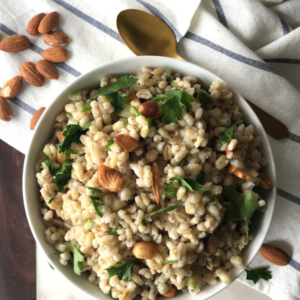 I love this combo of barley salad recipe. You can also try by adding different ingredients like mushrooms and kale. Make your own salad dressing and try this today! If this recipe interests you, look for similar recipes in my blog such as the Quinoa salad. For more delicious vegan recipes such as this sent directly to your inbox, just subscribe to my newsletter. Here’ s the recipe details. Wash the barley grains and put into the inner pot. Add water and stir well. Close the lid of the instant pot. Turn the steam release handle to “sealing” position and set 12 minutes of pressure cooking time. When time is up, open the lid using natural release. Meanwhile, roast the nuts and garlic with coconut oil in a small pan. Add roasted cashews and almonds, salt, pepper, chopped parsley, lemon juice, roasted garlic.